Here in Cape Charles, we’re a big golf cart town, and as the weather continues to warm, you’ll see that golf carts become the preferred method of travel. In fact, one local establishment, a cute souvenir shop called Chuckletown Productions, coined the phrase “Cart Life” to describe the golf cart craze in Cape Charles. (A bit of trivia for you: Chuckletown Productions’ name comes from Cape Charles’ popular nickname, “Cape Chuck.”) This souvenir shop even sells mementos with a golf cart theme, so if you want to take a piece of Cape Charles home with you, wear a “Cart Life” shirt with pride! Now, with all of this cart talk, you may be jumping at the chance to book a room at Bay Haven Inn of Cape Charles and slip into a golf cart to explore our bayside town. So, where do you go to grab a golf cart? The most popular solution is Eastern Shore Custom Carts, a company that says, “We offer custom golf cart builds from the mild to wild! For those who need a simple mode of transportation to the most discerning clients who want a head turning showstopper, “IF YOU CAN DREAM IT, WE CAN BUILD IT.” Whatever type of golf cart you desire, they’ve got you covered. Our very own personalized golf cart Chessy Bay came from Eastern Shore Custom Carts, so we highly recommend them! 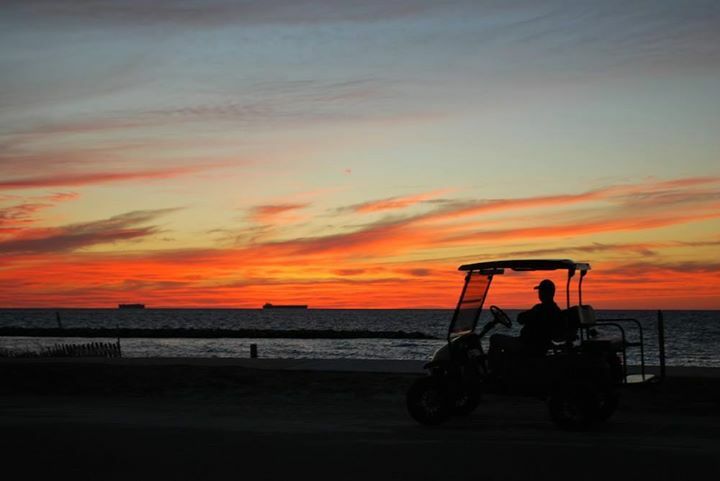 We look forward to seeing you soon on your golf cart adventure in Cape Charles!